Info It's your turn to do the dishes. Dishpan Hands is one of Jimmy T.'s microgames in WarioWare: Twisted! 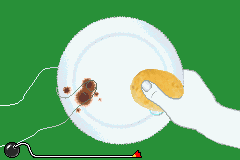 The player will be controlling a dish. The purpose of the game is to clean its dirty spot. If the player does so before time runs out, he or she will win. However, if the dish is not clean before time runs out, they will lose the game. 1st level difficulty: There will be a small dirty spot. 2nd level difficulty: There will be a two small dirty spots. 3rd level difficulty: There will be a small dirty spot and a lipstick mark, the latter of which is hard to remove. This page was last edited on January 22, 2019, at 21:07.